Few days ago, as my daughter came for a visit, I decided that my grandson was not comfortable enough in his stroller and I thought that this situation could not last one minute more! 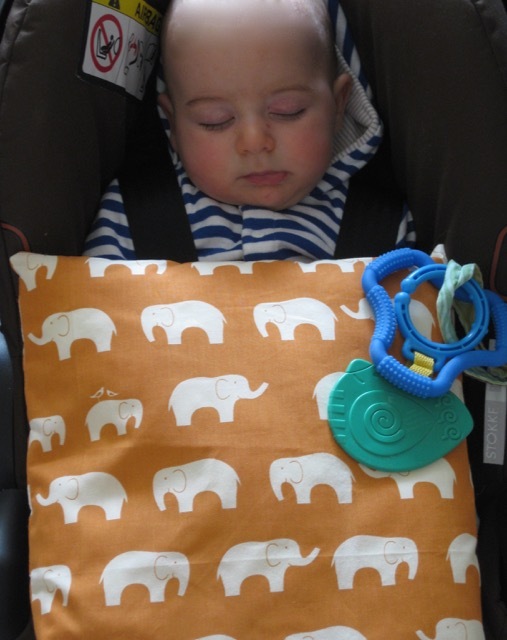 I went and fetch my Birch Organic fabric stash and proposed it to my daughter who chose this cut elephant print. To do this mattress, I just sewed an enveloppe and put inside five layers of batting. This process took less than 10 minutes! 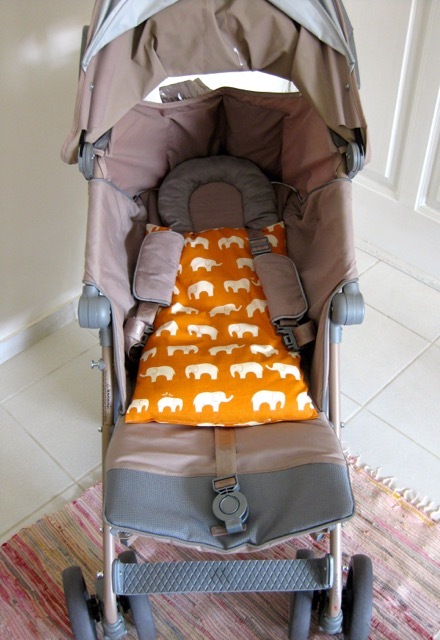 This sweet baby will feel now more cozy and I think that this orange color gives a cheerful touch to the stroller. The mattress has a second use : after moving the baby from the stroller to his car seat, we put it on him as a small quilt! Premier quilt fait par sa mamie.....quel petit chanceux !! Ne t'inquiète pas, je crois que je serai heureuse de faire pareil dans quelques années !! 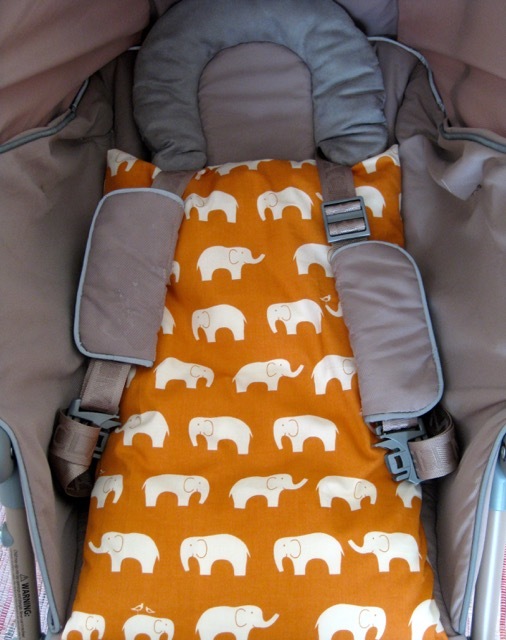 Love the orange with elephants. Thanks for sharing a quick baby "trick". Very sweet !!! and Little Marcel seems appreciate this mattress...Simple things are so beautiful ! I love the elephant print and the mattress looks very comfortable. What a great idea! Genius! You are SEW resourceful. The baby is absolutely precious, by the way! Well done! A beautiful baby on a beautiful mattress, well done! That is brilliant Christine! Your sweet little grandson looks Oh So Cozy now. I read your post very attentively, really it essential for us. When you go to abroad or travel you must need best travel stroller, So stroller is very important part for us. Wow! these strollers are amazing. These strollers provide a complete comfortable to babies. Thanks for sharing best strollers post. Keep sharing such an information posts.